Notice to Ethiopians: You are Being Evicted from Ethiopia — You are Unwanted! You are hereby warned; you are being given notice of your eviction from the country. You are no longer welcome here. Find a new place to live. We do not care where. All we want is your land, water and resources. They are no longer yours; but now are ours. If you resist, you will suffer the consequences. On the other hand, if you are willing to become part of a neo-slave labor force or to silently give up any claims to anything, you may stay as long as you are useful and compliant. We and our partners stand to make millions, if not billions, from this new economic investment and we will tolerate NO interference from you! The grabbing of fertile land going on in Ethiopia is not just rhetoric, fear mongering or in one’s imagination; but instead, it is real and happening at a ferocious pace all over the country. It will change Ethiopia forever and the major damage may be done by the end of 2010. We in the SMNE covered some of ways it has already impacted Ethiopians in our New Year’s article, Reflection Brings Questions read more.... Since then, we have seen additional alarming reports in the media and received new information from the ground. What we conclude is unless Ethiopians act quickly to stop this, we will no longer have a country to call our own. Why in the world would a government sell off its land and natural resources, much of which will be exported, especially being a beggar nation that feeds many of its people with food grown in foreign countries? It defies common sense, which makes it all the more dangerous. In the SMNE, we cannot be silent during this abusive exploitation and move towards making Ethiopia a slave state. Our family members have been displaced while foreigners are thriving. One can see that what this government wants is the land and resources but not the people. Ethiopians, whose ancestors have lived for centuries on the same land, are discovering that they no longer have any rights to it. Ethiopians, especially the most marginalized, are at risk of being evicted from their ancestral lands as it is being leased for almost nothing—and for many decades—to Ethiopian-owned and foreign-owned multi-national corporations, countries, banks and wealthy individuals. Businesses or investments owned by the ruling party, their family members and their supporting friends, both Ethiopians and non-Ethiopians, are capitalizing on this new opportunity to exploit new money-making schemes, only available to political and financial supporters of the Marxist-Leninist leaning Ethiopian government that still prohibits its own citizens from owning land. This betrayal of the Ethiopian people is being carried out by a greedy group at the top, willing to exercise its military brute strength to get its way; on the other hand, the way it is being executed reveals the desperation of a tottering government, willing to go to any means to get the necessary hard currency needed to better shore up their loosening control of the country. This is a legitimate concern on their part due to the increasing anger of the people; yet, these actions are simply fueling more anger that will require more force and money to contain. From the reaction we are seeing to this newest wave of shocking violations of the peoples’ rights, the Ethiopian Constitution, international human rights laws and God-given universal moral laws, it is only increasing the inevitability that this regime will eventually be ousted. The objections of the Ethiopian people are not about economic growth and development, foreign and private investment or capitalism in general if these were undergirded by appropriate legal protections and procedures. Instead, their objections are about the exploitation of the people, many of the most vulnerable, who are being robbed of all they own while the government threatens them into submission; sometimes literally holding a gun to their heads. This is happening all over the country. 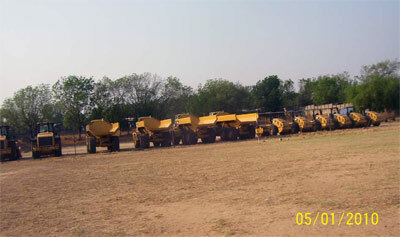 Look at these few pictures from Gambella, showing some of the 200 pieces of construction and agricultural equipment which have recently arrived in Gambella town, purchased by Mohammed Ali Al-Amoudi’s company, Saudi Star Agricultural Company, which now leases 10,000 hectares of land—just a start since he supposedly wants some 250,000 hc in total. Five hundred trucks are said to be arriving in February, just a portion of an additional 1500 to 2000 trucks said to be in the plans. 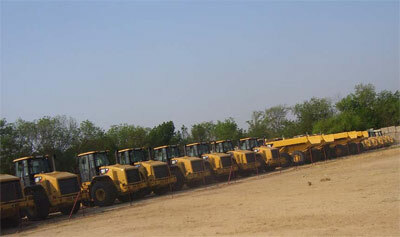 In the Abobo area of the Gambella region, Al-Amoudi has already started clearing the ground. 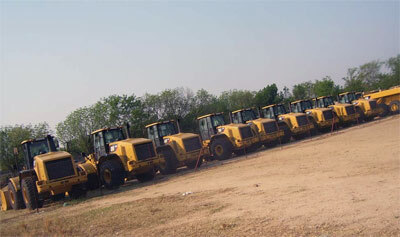 The location he is now clearing was land held by the Federal government as a natural reserve for wild life. The local people have been told to not speak to outsiders. We also have reports that Al-Amoudi had a meeting with the governor, Omod Obang Olom, where he told him he wanted the Anuak in the Diaspora to be silenced; saying he was willing to hire (bribe) people from the Diaspora who could counter any claims of exploitation with claims that this was going to benefit the people. Al-Amoudi is now also destroying forests in the Mazengir area, located in the area of Gomerra on the border between Gambella and the Southern Nations. 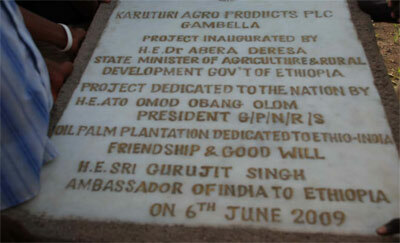 In Ilea, 35 K east of Gambella town, where the East Indian company, Karuturi Global, is clearing thousands of hectares of some of the most fertile Anuak indigenous land, he is in the process, cutting down the valuable Shea trees, which are a rich source of high quality cooking oil, lotions and food. Gambella is one of the few remaining areas where Shea trees can still be found in Africa, trees that take twenty years to reach maturity. These trees were the focus of study at Addis Ababa University, where researchers recommended that this area become a protected reserve, but now Karuturi has fourteen tractors working daily to destroy this precious and endangered natural resource. Even more upsetting to the Anuak is the clearing and destruction of Anuak burial ground. However, they are afraid to speak up in protest because if they do, the government will arrest them. The company has joined with the government in also warning the people to not talk about all of this at risk of being arrested and losing their jobs. Instead, they have been told, if a reporter approached them with such questions as to whether they would be receiving any compensation for their land, they were to say that the company was planning to do something in the future. However, no contracts or agreements have been signed and no details given. 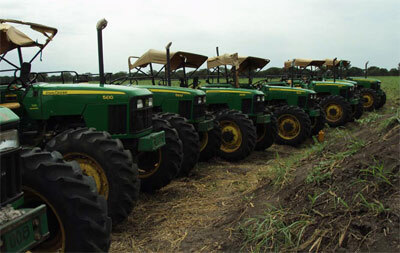 The Meles government has now requested 90,000 hectares of land close to Gambella town, for their own use. In fact, what they are doing is claiming this land for EPRDF government supporters. Now, people from anywhere in the country, as well as those living in the Diaspora, can go to the Ethiopian Embassy, pay $500 and receive a yellow identification card, giving him or her, the right to invest in Ethiopia. Now, many of these people are coming into Gambella and making formal requests for this land. In other words, someone from the EPRDF can say they want a certain amount of land, but do not have to pay for it. Instead, they are given a certificate that they now own this land, giving them “the capital” to now borrow money from the Ethiopian bank to pay off the land loan and even invest in another business. At the same time, the indigenous people of Gambella are being displaced from their land, get no compensation for it and no opportunity to obtain such loans; particularly if they are not EPRDF members—members who will of course, later be expected to vote for the ruling party in the upcoming election! While this is all going on, for the first time in memory, the self-sufficient people of Gambella are experiencing a drought and many are threatened with hunger and starvation just as their lands are being taken over by outsiders. Meles alleges that the Gambella regional government gave him the green light to assume control over the leasing of the land because the people of Gambella are too uneducated to do it. However, when you ask the people, even those in some positions of authority in Gambella, they will tell you that the government simply took over the land without ever consulting them. But by now, you know, everything done by the government of Ethiopia is based on deceit. When Meles calls the people of Gambella uneducated, he fails to mention the fact that there is not a single university or college in the entire region; despite the building of many universities in his own Tigrean region and other regions since he came to power twenty years ago. He also fails to explain why his government troops targeted the most educated leaders in the Anuak massacre of December 13-15, 2003. Marginalization of the people in coveted sections of the country can mean “exploitive opportunity” for shrewdly manipulative leaders like Meles; yet, it leaves the silenced people, victims of an apartheid system, similar to South Africa. This discrimination is immoral and shameful and only creates more simmering tensions among the people that could erupt someday. We have heard that the same thing has been going on for even longer in Welkayit Tegede, a very fertile part of the Amhara region. Victims of these land grabs are forced to stand by while their ancestral land is given away and their children pushed aside. Now, in the Welkayit Tegede area, formerly the Amhara region, but in the process of being acquired by the Tigrean region, everyone, for the first time, is required to speak Tigrean. If they refuse or are unable to comply, they are told to leave the area and go to the Amhara region. Most of the people in Welkayit Tegede have already lost their ancestral land this way. In the southeastern part of Ethiopia, a recent conflict erupted between civilians and militias, loyal to the ruling party. It occurred in the Ogadeni province of Shiniile following a protest over the government’s confiscation of 60,000 hectares of the most fertile land, allegedly sold—or leased—to a Chinese consortium or to highlanders, migrating to the region. These are just a few reports, but the same thing is going on in the Afar region, in Beninshangul-Gumuz, in Oromia, in Southern Nations and wherever there is desirable land or resources. Reports have included allegations by the new Ethiopian laborers that they are not being treated with respect. I was told about a man working on a farm in Bako outside of Addis Ababa who demanded better treatment for the local people from their East Indian company, Karuturi Global, employer. The East Indian man accused him of having an attitude and asked him about what tribe he belonged to, accusing him of being an Amhara. He said, “We were told that the Amhara are the stubborn, control-freaks and that this is not your time.” He fired the man. Who told this man such prejudicial opinions about the ethnicity of Ethiopians? Ethiopia—the land, the water, the resources and the people—are now being sold to the highest bidder by none other than their own government under the dictatorial leadership of Prime Minister Meles Zenawi—a “neo-slave trader” of the 21st century. Human beings have been sold since the beginning of time; often by those closest to them, but as a society, most of us hoped this was in the past. Jesus was betrayed by Judas who “turned on him” for thirty pieces of silver. Joseph, one of the patriarchs of the Bible, respected by Jews, Muslims and Christians, was sold by his own brothers for twenty shekels of silver to slave traders going to Egypt. During the years of African slavery, it was usually not the western slave traders who captured the Africans to be sold; but instead, it was opportunistic Africans who preyed on other “tribes” they devalued or with whom they competed, making profitable deals for themselves at the expense of these other human lives. We know the rest of that tragic story that only came to an end when people of moral and political will stood up against this structural evil. During the invasion of Ethiopia by Mussolini’s Italy in 1934-1941, there were Ethiopians who took bribes from the Italians and betrayed Ethiopia for a price. None of this is new, but unfortunately, we now have new turncoats and slavers in our midst and it is the EPRDF government of Meles. The inherent reason for government is to protect its people and to enhance their well being; however, in Ethiopia, the opposite is true. The people need protection from this oppressive government that uses force, lies and a perversion of justice to confiscate anything they want. If the people get in the way, they are expendable. If we, the people of Ethiopia do not quickly take action, Ethiopians living on their ancestral land will soon be considered trespassing and the laws of a corrupted land will evict them. Ethiopia will no longer be owned by Ethiopians, but will be under the control of outsiders and a handful of elite. We will either have to leave the country or become the neo-slaves of the 21st century. This is intolerable and unacceptable. What would possess a leader of a country to do this? Everything he is doing is a contradiction between talk and action. A month ago Meles was in Copenhagen begging for billions of dollars to protect the African forests, but here he is in Ethiopia, destroying our forests and giving the land away for nothing rather than feeding Ethiopians. It is immoral. It is time for all Ethiopians to stand together to stop this craziness. This should unify all, including the many people fighting in liberation fronts: the Gambella Liberation Front, Ogaden National Liberation Front, the Oromo Liberation Front, the Afar Liberation Front, the Sidamo Liberation Front and the Benishangul Liberation Front. If we do not act together now, you may not have a region to liberate for by the time you do, it may already have been sold to the Chinese, India, Saudi Arabia or some other country. This is the time for all of us to come together and to stand up as one people to save the country. Let us save our people from being sold into slavery. The land belongs to all of us and is where we and our families have lived for many years. This should unify us. This savage attitude of Meles must be stopped so for those who are in liberation fronts and for those who are not; let us liberate our thinking from tribalism and free the country! Fighting alone is what gives Meles the green light to do what may quickly become irreversible damage. We do not have the luxury of remaining separate anymore for if we do, we will be finished. Then we will share in defeat. Instead, let us reconcile and stand together as one nation of people who will value each other, passing on a blessing rather than a curse to our descendents. May God help us and save Ethiopia from destruction!